“Eat more amazing” – this is the slogan of Deliveroo’s latest ad campaign, aimed at raising brand awareness by showcasing the variety of takeaway foods available on its app and highlight that they are delivered “when and where you want it”. 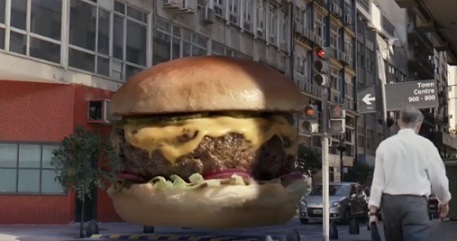 The TV spot, soundtracked by the Everly Brothers’ 1958 hit single “All I Have to Do Is Dream”, features a city where huge dishes including pizza, curry, salads, burgers, ice cream and macaroons, are floating among vehicles and people, abiding by traffic rules and road safety, to get to their recipients, who are users of the Deliveroo app. The “Eat more amazing” campaign, launched February 21, also runs across outdoor, the online food delivery company constructing a billboard four meters tall and six meters long out of burgers that could be picked by passersby. The lucky ones were those who walked through the Old Truman Brewerey area in London, on March 13. Radio, mobile and social activity are also included in the campaign. “All I Have to Do Is Dream”, made famous by the American country-influenced rock and roll duo, became their third chart topper on the country chart. The song, which has been included on notable lists of the best songs or singles of all time and received the Grammy Hall of Fame Award in 2004, is featured in the 2001 film Riding in Cars with Boys, appears in the game Mafia II, at the credits of the 1999 HBO special adaptation of “Goodnight Moon”, and at the end credits of the 2010 remake of “A Nightmare on Elm Street”. Roy Orbison, French singer Sheila, Bob Dylan, Andy Gibb and Victoria Principal, Jeff Bridges and Karen Allen, R.E.M., and Ant & Dec have also recorded the song.